David Duckworth, Corporations. Acrylic, 2012. 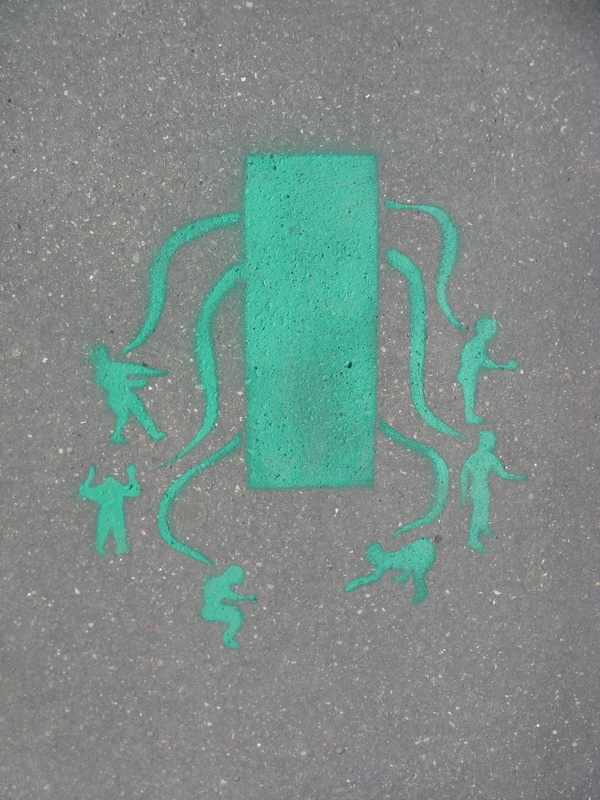 Stencil executed by Philippe Barnoud on bridge near Paris University 8, Saint-Denis, for exhibition, Écritures en migration[s]. This is a second installment from Fred Branfman, originally posted at alternet.org. A first installment appeared here on June 27, 2013. The U.S. Executive Branch is your enemy if you believe in democracy, as described in the just-published article below. We may obey it, as we do any illegitimate power, because we fear the legal consequences of disobedience. But it has no legitimate claim to our moral allegiance. As the quote above indicates, the Executive immorally operates in secret primarily to avoid democratic accountability. Many have until now understandably prioritized other issues over fighting for democracy itself. We can no longer. President Carter correctly says America does not have a functioning democracy, as does Senator Wyden in warning that we must act now before it is too late. A new “pro-Democracy” mass movement in America will be the necessary precondition for making significant progress on any other issue in the coming decade. Fortunately though, like a bolt of lightning suddenly illuminating a dark graveyard, the potential has arisen for a new mass movement for democracy unlike any we have seen in our lifetime. The July 24th Conyers-Amash amendment forbidding NSA mass collection of our phone and Internet records came within seven switched votes of passing the House. If this new Congressional coalition of strange bedfellows from left and right is paralleled by a similarly broad mass movement, there is new hope for curbing anti-democratic Executive power. Millions of Americans will face a basic question in the coming decade: how much loyalty do we owe a U.S. Executive Branch which extracts huge sums from us to spy upon and lie to us, on the false grounds that doing so is protecting us? Or do we owe our moral allegiance to the ideal of democracy, which requires us to fight the Executive which is its enemy? Senate Intelligence Committee member Ron Wyden recently issued an urgent call  to “rein in this omnipresent, ever-expanding surveillance state”, warning that “if we don’t do it now our generation’s going to regret it forever”. Wyden and his colleague Mark Udall — who have revealed that even as Senators they have been consistently denied information,  lied to , treated like children unable even to take notes , and are even now muzzled from revealing  far more massive Executive subversions of democracy than is known — have become the canaries in the coalmine. They warn us that though still largely odorless, colorless and invisible to most of us, poisonous Executive power is slowly destroying what remains of a “functioning democracy” in this country. The meaning of an ex-U.S. President’s astonishing statement is clear. For the Executive’s threat is not only to “privacy” or “civil liberties” but the very structure of democracy itself. As Wyden and Udall have demonstrated, the Executive Branch has unilaterally seized power since 9/11, behind a curtain of secrecy, in a way that has destroyed our constitutional system of legislative and judicial “checks and balances” on its power. This threat has been ignored by many because it so counters our childhood beliefs that our government fights for democracy against foreign enemies. But the evidence clearly indicates that it is the U.S. Executive Branch, not foreigners, which is today U.S. democracy’s main enemy. And it also clear that saving our liberties will require a new pro-democracy mass movement as unprecedented as the Executive’s post-9/11 power grab. As millions of us come to realize the truth of Wyden’s warning over the next decade, we will be forced to ask the most basic of questions: is this the America we grew up believing in, or want to live in now? And, if not, are we willing to fight for democracy before, as Wyden warns, it is too late? It may sound over-dramatic to the comfortable, complacent, or fearful, but he is correct. Our generation must respond to his call to arms for democracy or it will disappear. This nation has of course faced threats to democracy in the past, in the last century, from the Palmer raids  and jailing of Eugene V. Debs  for speaking out against World War One, McCarthyism , FBI criminality  in the 1960s and beyond, the CIA abuses catalogued by Senator Frank Church  in the mid-1970s, and Iran-Contra  in the 1980s. And, as President Eisenhower  warned us, the “military-industrial” complex has been slowly choking off democracy since the end of World War II. But the Executive’s current assault on democracy is unprecedented. As a result of previous unimaginable technologies of surveillance and control, and the fear generated by the attacks on 9/11, the U.S. Executive has constructed on American soil a massive apparatus of surveillance and potential population control never before seen in our history. This apparatus includes the mammoth Department of HomelandSecurity  and intelligence-gathering and police entities located in 17,000 buildings  around the nation; giant data storage  and collection centers driven by ever more powerful and intrusive software storing all Americans’ phone and Internet data; 72 police/military intelligence “fusion centers ”, which have already begun  to target  domestic dissidents; and, increasingly, paramilitary-oriented  police-departments, often with secret police units. While most of this apparatus is presently directed at potential threats from abroad, it is already devoting an unprecedented amount of time and money surveilling Americans at home. And it can be increasingly turned against the American people, media, Congress and the Judiciary in the likely event of increasing social disruption, and/or new domestic 9/11s, in the coming decade. And this visible threat to democracy is only part of the problem, as the Executive Branch behaves more like an Occupying Power ruling from above than a democratic institution controlled from below. In the past, it waged its wars abroad and an American middle class still prospered at home. But today its priorities are also accelerating America’s economic and social decline, as its wasted $4-6 trillion long-term  on two losing wars in the past decade alone and consumes over $1 trillion annually , as the middle class slowly disappears. As America’s economic health , society , infrastructure , schools  and social mobility  continue to decline, the rich grow richer and the poor poorer , automation  and the continued export of jobs  leads to rising mass underemployment , our youth are increasingly indentured  by massive student debt, millions of workers can barely survive even when working two or three jobs , and assaults on the safety net  grow, it is inevitable that growing numbers of Americans will protest their conditions. And, unless we rein in the Executive, it will inevitably respond to increased protest with increased police tactics threatening democracy itself. And putting aside the flagrant abuses that we now know about, the creation of an Executive Branch Surveillance State already threatens to cast a subtler and ultimately more disturbing pall over the land. The little jokes so many now make along the lines of “this email is just between you, me and the NSA” suggest that many Americans are already nervous about expressing views, or writing words, that might trigger government scrutiny. And self-censorship is far more pernicious than heavy-handed government censorship. And, worse, there comes a point when we don’t even realize we are censoring ourselves anymore, when “dangerous thoughts” are not even brought to consciousness. Millions of our young people, forced to seek scarce government or corporate jobs to pay off massive student loans , are increasingly fearful of political associations or activities that they fear might hurt their future employment prospects. Many are careful about what they say or write to each other on the phone or in emails and, unconsciously, even what they think. And, as McClatchy  has reported, millions more federal employees are now required to spy and inform on each other at the risk of losing their jobs. They are not even allowed to remain silent, since employees can be fired if it is subsequently found that they could have reported a co-worker but did not. An estimated 1.4 million public and private sector employees have obtained their “top secret” security clearances by submitting to intrusive and thorough “background checks”. They have done so because such a clearance is, in Dana Priest and Bill Arkin’s words, “a passport to prosperity for life”, offering secure, high-paying jobs. They tend to live close to one another, in some of the wealthiest communities in America . The result is an increasing tendency toward “group think”  and conformity, as such individuals lose even the capacity for independent thought outside politically prescribed limits. And those charged with protecting our privacy can hardly be trusted to do so when they have already given up their own. The Executive’s unprecedented threat to democracy requires an unprecedented response. The great mass movements of the postwar era have involved issues of social, economic, gender, sexual and racial justice, war and peace, and the environment. “Civil liberties” have largely been left to organizations like the ACLU. But now a new “Democratic Rights” movement, with at least as much public support as the “Civil Rights” movement of the 1960s, will be required for democracy to exist. And if democracy goes, so too will social justice, the environment and peace. A “Democratic Rights” movement is a necessary precondition for everything else. Until recently it was difficult to even imagine how Executive power could be limited, as a cowed Congress massively funded it after 9/11 while democracy burned. But on July 24th, like a bolt of lightning suddenly illuminating a dark graveyard, a surprising Congressional vote  provided the first hope for asserting democratic control over Executive power. A unique coalition of 111 Democrats and 94 conservatives came within only seven switched votes of passing a bill to halt the Executive Branch’s unconstitutional collection of all Americans’ phone and Internet records. The vote’s importance was not only that it was the first major challenge to the Executive’s post-9/11 power grab. It also significantly showed that there was a difference between Congress and the Executive. Overall, members of Congress are controlled by the economic interests upon whose money they depend for reelection, and they have done nothing to halt climate change, growing inequality, and Executive drone and ground assassination abroad, etc. But this vote suggested that there is daylight between Congress and the Executive on the issue of surveillance and, hopefully, other issues fundamental to democracy. The hope that Congress will create a functioning democracy in America may prove to be naïve. But, if a grassroots movement can arise to support this cause, it will be Americans’ only hope of rolling back authoritarian Executive Branch power. The greatest significance of the Conyers-Amash vote was that embodied a new politics entirely different from the traditional liberal vs. conservative divisions that have brought a moribund Congress to a halt. This new politics pits both liberal and conservative opponents of government surveillance against an unholy and unprincipled alliance for authoritarianism that includes Barack Obama, Paul Ryan, Nancy Pelosi, Eric Cantor, and John Boehner. After years of gridlock, the House experienced a sudden pushback against Executive power unlike any we have seen in our lifetimes. This new Congressional coalition gives new meaning to the saying that politics makes strange bedfellows. Republican votes for Conyers-Amash included both principled opponents of surveillance, and those who support  surveillance but want it done entirely by the private sector. And Democratic supporters for the amendment included both principled progressives who have long fought for civil liberties and peace, and more centrist types who have rubber-stamped past Executive war-making without a peep. It is uncertain whether this unwieldy coalition can hold in coming months given these differences, the gravitational pull of the old politics, and the enormous Executive power and deception they will face. We can safely assume that military-intelligence-police firms and the Pentagon itself are already mercilessly pressuring pro Conyers-Amash members back in their districts, and, in D.C., Mr. Obama and Ms. Pelosi are also strongly lobbying for mass surveillance to continue, covering up their betrayal of democracy with meaningless promises of greater transparency. Even if restrictions on NSA spying on innocent Americans pass the House, they would face an uncertain future in the Senate. But two things are certain: only if the proto-coalition that favored the amendment can hold and expand in coming years will there be any hope of creating a “functioning democracy” in our nation. And second, for this to happen there will need to be a new grassroots movement of similarly strange bedfellows committed to fighting for democracy. The Amash-Conyers vote also provided dramatic evidence of how the U.S. Executive does not represent the American people. The Executive was only able to spy on Americans because it deceived them by denying it was doing so. When Americans found out about the spying, however, an Economist poll  showed Americans opposed NSA surveillance by a 59-35 margin. Americans clearly would not have agreed, had the Executive Branch honestly sought “the consent of the governed,” to allow it collect all their phone and Internet records. By unilaterally, lawlessly and secretly seizing the power to do so, and lying about it when asked, the Executive Branch has clearly lost its moral legitimacy. We may obey the Executive because, like any people living under illegitimate power, we fear the legal consequences of disobedience. But it has clearly forfeited any claim to our moral allegiance. The Executive has justified its assaults on democracy, like all authoritarian institutions before it, on the grounds that it is protecting us. We frequently hear, for example, that we must accept less freedom in order to have more security. In fact, under present Executive rule, we have neither. On August 21st, the Washington Post reported  that it took a year-long Electronic Frontier Foundation lawsuit to force the NSA to declassify a secret court ruling revealing they had been illegally spying on American-to-American communications in violation of every public claim they had made on the subject. The idea that this document was classified because some “foreign enemy” could use this FISA report to hurt us is silly. What possible interest could al-Qaeda have in a document proving American agencies were spying on their own people? The FISA court document, like most Executive classified material, was obviously kept secret to hide Executive wrongdoing from Americans, not “foreign terrorists”. And not only does Executive Branch spying on innocent Americans at home not protect us, as dozens of national security experts have stated, its foreign drone and ground assassination programs are in fact endangering us (please see list of experts cited at the end of Part I  of this series). They have created exponentially more enemies than they have killed, strengthening U.S. foes and weakening potential allies, and increased the possibility of more domestic terrorist attacks and nuclear materials falling into terrorist hands. A U.S. foreign policy that turns nations like Pakistan into allies not enemies, e.g. by bringing them electricity rather than drones, will make possible the kind of joint police-work which alone can significantly reduce the foreign terrorist threat to America — at a fraction of present vast over-spending. At the start of each new Congress, members swear  to “support and defend the Constitution of the United States against all enemies, foreign and domestic.” This oath clearly obligates them to fight democracy’s chief domestic enemy today: the U.S. Executive Branch. And it is not only Members of Congress and Federal Employees who have a duty to fight to preserve democracy against the Executive. So do we all. In speaking of the U.S. Executive Branch as the enemy of democracy it is important not to demonize its leaders as individuals. They are like most Americans in their off-hours. Many are patriotic and believe that they are protecting the American people, and their patriotism deserves respect. They presumably love their mates, children and pets in the same proportion as does the general population, also hit Home Depot on the weekends, and enjoy sports and “Downton Abbey” as much as any of us. We are not talking about Nazis here. But when they go to work for the institution we call the Executive Branch, it is a very different matter. They spy on us, we do not surveil them. They take and waste enormous sums of our money, we do not take theirs. They hide their activities from us and lie to us when they are caught — we do not do so to them. They threaten whistleblowers and journalists, we do not. They claim the right to murder or imprison us without trial, we make no such claim on them. They have endangered us creating exponentially more enemies than they kill, we do not endanger them. It is the problem of the “True Believer,” one of the most dangerous of social phenomena. Their self-righteous need to feel they are protecting us leads them to feel justified in breaking any law and telling any lie in pursuit of their mission. Freedom of the press, telling the American people the truth, obeying the law, are irrelevant to true believers who decide they have a higher calling. It is the same phenomenon observed during the Iran-Contra scandal after Congress halted military aid to the Contras. Because Executive Branch officials like James Poindexter and Oliver North were so convinced that they were on the side of the angels they felt justified in operating secretly, lying about their actions, and breaking just laws. For the past 50 years many Americans, notably its political-media-intellectual elites who have known the horrific facts, have turned a blind eye to the Executive Branch’s murder, maiming and making homeless over 20 million non-Americans, mainly civilians. (Please see Part 2  of this series, “The World’s Most Evil And Lawless Institution? The Executive Branch Of The U.S. Government”; posted at this blog on June 27, 2013). CNN commentator Jeffrey Toobin recently reflected the Washington elite’s indifference to this mass murder when he called for  Private Manning’s imprisonment because the Foreign Service Officers, “who wrote these cables have devoted their lives to making the world a better place.” Like his compatriots, he simply ignored the fact that those Foreign Service Officers have been an integral part of the U.S. Executive apparatus that ruined those 20 million lives, and has in many other nations propped up savage dictatorships practicing mass murder, assassination, torture and incarceration of the innocent. But as the Executive’s indifference to the rule of law and human decency now increasingly comes home, millions of us will no longer be able to ignore Executive wrongdoing. We will be forced to decide whether American democracy is worth fighting for. Executive Branch secrecy, deception, and surveillance has reached such levels that it has become a revolutionary act simply to insist that the U.S. Constitution be obeyed, i.e. that the Executive obtain the “consent of the governed” for its actions — the trailblazing concept by which America replaced the “Divine Right of Kings” with the will of the governed as the basis for legitimate rule. The Washington political-media elite who call for jailing whistle-blowers for “breaking the law” has lacked the integrity to demand similar punishment for the far more lawless criminal behavior of such Executive Branch officials as NSA chief Keith Alexander and Director of National Intelligence James Clapper. Does anything threaten democracy more than when Executive Branch officials repeatedly deceive the Judiciary, as well as the Legislature and American people? Should not this behavior lead to criminal sanctions for General Alexander? Many mass media journalists ask who gave whistleblowers the right to release classified information. It is a fair question. But they have not dared ask a far more serious question: who gave Executive Branch officials the right to secretly and unilaterally collect all Americans’ phone and Internet records? And it certainly wasn’t Mr. Obama, who we now know was elected on false promises that he would bring transparency, respect for civil liberties and a free press, and whistle-blower protection to the Oval Office. He clearly does not have the right to unilaterally and secretly create a Surveillance State in this country without the consent of the governed. Mr. Obama placed his former post as a Constitutional Lecturer at the very core of his identity. Americans certainly did not give him the right to betray them, everything he claimed to stand for, and the constitution. His approval of Executive spying on Americans, and constant lying about it ever since, in no way legitimizes it. No, the Executive Branch has seized this power simply because it could, in a lawless power grab without precedent in this country. And if democracy is to be preserved here this rule of men not laws, this practice of might makes right must be ended. The Washington Post recently reported  on an internal NSA audit revealing that the NSA had violated the law “thousands of times” a year since 2008 at its Fort Meade headquarters alone. And “a single `incident’ in February 2012 involved the unlawful retention of 3,032 files that the surveillance court had ordered the NSA to destroy.” That is, we now know the NSA had committed tens of thousands, possibly hundreds of thousands, of individual abuses already. It is important to note also that this audit was kept secret from the American people until Edward Snowden revealed it. Typically, it was hidden because its contents would help America’s enemies. It is laughable to imagine that Ayman al-Zawahari would be helped by knowing that the NSA was constantly breaking American law and lying to its citizens about it. Like the FISA Court report cited above, it was classified secret to keep its findings of NSA abuse from the American people. We now know where the most massive Executive Branch abuses of democracy in postwar history have begun. But we have no idea yet where they will end. The surprising support for the amendment forbidding NSA spying on innocent Americans gave hope that Congress could eventually act to curb the Executive threat to democracy. Amazing even its own sponsors, it was only stopped because Mr. Obama and Nancy Pelosi abandoned their core principles to muscle Democrats into opposing it. Despite Obama and Pelosi’s short-term success in beating back attempts to limit mass spying on Americans against their will, however, the bill represented a watershed in American political life. Providing a desperately needed fresh and cleansing wind blowing across a sick and dying Congress, it foreshadowed a new movement aimed at saving American democracy before it is too late. In the concluding section of this series we will discuss what the basic goals of a new “Democratic Rights Movement” must be if we are to end the Executive Branch’s threat to freedom in this country.